This has become a solid go-to in my arsenal of bus comps! I tried the demo first and was full convinced to grab this plug, and couldn't be more pleased. Perfect for drums and vocal busses, and what makes this stand out is the ability to adjustable low end frequencies to let the kicks sneak through. On drums this is an awesome tool, especially if you work in dance and urban music where you need your drums to really pop out in the mix yet still have controlled compression to tame all you're throwing at it. Can't say enough good things about this Buss Compressor, love it. A really nice Buss Compressor. I've been using this on my main buss and it's been stellar. Very nice to have a mix control - very handy, indeed. I'm not using it for pumping or deep compression effects, just as a nice gentler 2:1 before the Limiter and it's fantastic! I've been able to achieve a nice balance of headroom and volume. I can highly recommend the precision buss compressor, Its one of my favorite plug ins to use on drums. I make a lot of deep/house records, and for me the biggest sell point is the ability to control your compression with the smoothest of controls! . Perfect for glueing sounds, New york/parallel Compression, among other sonic duties like mastering. Well, I liked this one because of its versatility. options that you will find in every buss compressor. under the frequency chosen on the FILTER option. IT'S AWESOME. And it has the MIX option that lets you make a parallel compression if you want. The meters are very accurate and sensitive. ...however, I'm now beginning to think I should've bought the Precision Limiter instead. This plug-in operates near silently, unless you really push it to stupid limits, but I still can't tame some snare shots without compromising the track's overall sonics. That's probably more a criticism of me and my choice of sounds during tracking than with the UAD Precision Buss Compressor. I have a beautiful Yamaha C7 piano in my studio that I record often, and I've tried many different compressors on it, but they all have issues. The Precision Buss Compressor is the only plugin that I have found that will tame the dynamics of a performance on my piano without poorly affecting the original signal. I highly recommend!! My favorite mix buss compressor by far! After trying a hanfull of the popular competitors, I've finally settled on the UAD Buss comp! It doesn't have that "hard" SSL style sound or a round sound..or any kind of sound for that matter, it just stays out of the way and does what it's supposed to. You get precision control over your transients with virtually no coloration. Only the essential components and knobs with no gimmicky features, which makes it a snap to use!! Great for NY style parallel buss compression and I also use it on the master from time to time. I had this plug in for over a year now. I tried it in different situations and with diverse styles of music, I have settled for using it in the main out bus during mixing. As a main bus compressor this plug-in is excels regardless of the music style or instrumentation of the band. I use it for rock mixes as well as orchestral film scores. The sound is clear and transparent and it responds gently to gentle changes in the threshold and attack parameters. I have tried many bus compressors while mixing, including the SSL emulations, I honestly prefer this one. The only reason I do not give 5 stars is because I rather reserve that rating for plug-ins that are out of this world. This one is not quite out of this world, but I use it all the time and it always delivers. I compared this to the SSL Bus Compressor and this is more transparent and maintains the quality of the audio better than the SSL. If you want to hear a mix where this was used on the master, check out www.reverbnation.com/rialety. "Steppin Out" track. Spitzenteil! Wie immer eine klangvolle" In The Box" - Lösung von UAD. No SSL harshness, respect the ratios and you will get a lot out of this one. Standard UAD kudos! I highly recommend the precision buss compressor !!! Honestly, I tried the demo of every single master bus compressor UAD has to offer. This honestly has the best bus compression that exists. Nothing matches it, even neve stuff, zener limiter, so on and so forth.. nothing comes close. The pump and breath preset is amazing. set it to 70% mix, for slight parallel compression and you're ready to instantly improve your master in a noticeable way. I never.. EVER stray from this now. 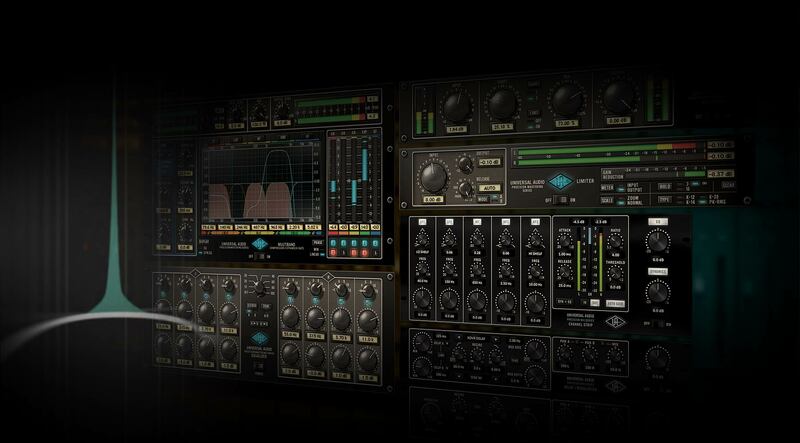 No other plugin on the market, even from other brands, comes close. the only thing that sounds remotely decent in comparison, is the cl1b from softube(which is also on UAD), using a master bus warmer preset or something or the other(Cant quite remember the name of the preset but still). Otherwise..nothing really matches the forwardness.. control... balance... that this can bring. Demo it if you don't believe me. Its well worth it, HANDS down. I love this comp in a pinch! The compressor is a workhorse! Now the mixing is not done without his participation :) Very good compressor. One of my favorites.